Clean and intuitive Twitter client. Is there a better alternative to Osfoora for Twitter? Is Osfoora for Twitter really the best app in Internet Utilities category? Will Osfoora for Twitter work good on macOS 10.13.4? Osfoora for Twitter is a powerful Twitter client with a clean and intuitive user interface. You'll enjoy a wide set of powerful features such as Muting users, Read Later, Message Conversations, Multiple Accounts, and more. 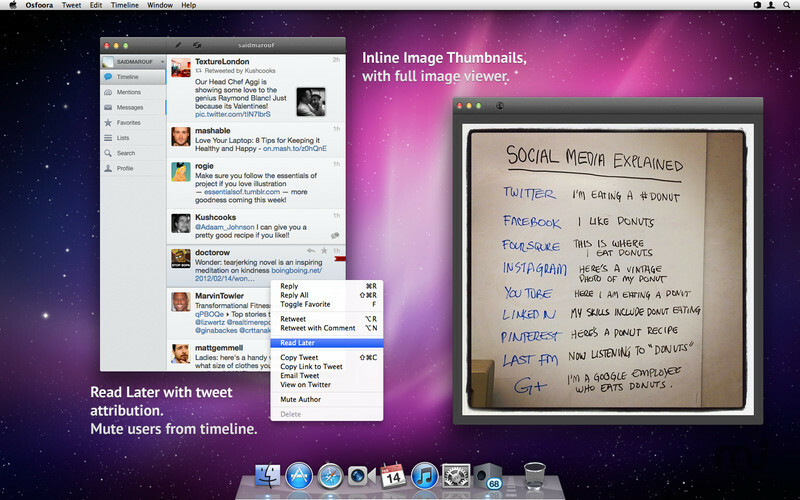 TweetMarker Support: Timeline syncing of reading position between different Twitter apps. Inline picture thumbnails for popular services, e.g. Instapaper, Twitter, Yfrog, and more. Mark Tweets belonging to specific users. Attach multiple images/videos to tweets. Image Services: Yfrog, TwitPic, Twitter, CloudApp, Imgly. Set your own custom Image Upload end point (Must follow the TwitPic API and use JSON). Video Services: TwitVid, Yfrog, TwitPic, CloudApp. Read Later (Instapaper & Read It Later) with tweet attribution. URL Shortening via CloudApp (Default is Twitter). Direct Messages with conversation view. Search Twitter and view trends. Flexible Font sizes (11pt - 20pt). View users on Favstar, and Twitter websites. Notifications via Growl and Dock Icon. Edit your Twitter profile info. Robust Keyboard controls for navigation and popular tasks.